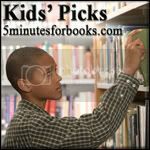 Time for another Kids' Pick carnival at 5 Minutes for Books! Surprise, surprise, in preparation for the upcoming Chronicles of Narnia Reading Challenge, we've been reading and browsing through some Narnia titles for kids lately. 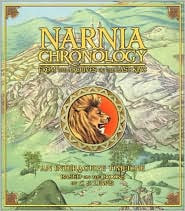 One of my (2 1/2 year old) son's favorite Narnia books to flip through is the Narnia Chronology . Filled with pop-ups, flip downs, pull outs, etc., etc., it's a nightmare for parents to read through with curious little hands. This book would probably best be suited for ages 5 and up but Bookworm 1 loves it and who am I to say "no" to developing an early love for Narnia?! (Perish the thought!) Besides, it's admittedly fun to watch the stone table break apart and watch Aslan pop up, looking both vicious and victorious at the same time. When you open this book, you are introduced to Narnia in Year 0. Digory and Polly explore themselves into a magical new world. Aslan appears on page 2, along with a spin-the-wheel feature displaying the creation of Narnia. My one and only complaint about this book is that it seems to lay out the history of Narnia in a modern time frame. For example, the Last Battle happens in the year 2555. The book counts out Narnia's years but it makes it sound like somethings occurred in our time 1998, etc. which is somewhat confusing. I rather wish they hadn't tried to put years on it. In a way, that sort of de-mystifies it too much in my humble opinion. However, I'm willing to overlook this as it might just be something that annoys me, personally. This book is wonderfully interactive and really draws the reader (both old and young alike!) into it. We love it. HE loves it. Mommy hopes it will actually last until he is five years old but if not, that's ok. If he learns Narnia, I will be satisfied. Speaking of Knowing Narnia - won't you consider joining in on the Narnia Reading Challenge? Sign-up is on Friday. No need to have read a single Chronicles of Narnia book by then. The only thing you need to do on Friday is come back here and tell me that you are planning to participate. Then you have until July 17th to read as much or as little of the Chronicles as you would like or time permits. The goal of this challenge is only to become acquainted with the Narnia (and Aslan) or, perhaps, just revist old haunts. I hope you'll plan on it! HA--hopefully it will last. . . . I used to so protective of such things, but when I saw that the Thomas & Friends anthology had been completely beat up and destroyed, I realized that I was totally fine with it. Number 1 -- I got it at a garage sale for a dollar or two, and Number 2 -- it means it's well-loved (and stepped on and whatnot due to the fact that it sat right beside his bed for many many months). This sounds great, Carrie! I've thought about doing Wardrobe as a read-aloud, but I'm not sure how my girls would handle the Witch's cohorts. They're pretty scary, even to me. You know I'm in for the challenge! We've got a busy, busy weekend coming up, so I hope I can get back over to sign up! Now why have I not seen this book anywhere??? We have an EXCELLENT Unabridged Prince Caspian Audio Book by Lynn Redgrave! It is so enjoyable, Max just loves it. Sounds like a very cool book - but I'd be so hesitant to let my son touch it, he is so rough with his books it drives me crazy! Catching up on blog reading and discovered your Narnia challenge--lovely idea! We bought the Chronology book for one set of nieces and nephew that are really into the Narnia books right now and it was a huge hit. Happy reading!